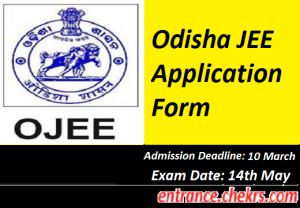 OJEE Application Form (ओडिशा जेईई आवेदन पत्र) 2017: OJEE 2017 is a state level exam for the aspirants seeking for the admissions in engineering in the state of Odisha. OJEE 2017 is conducted for the admissions in the second year of B.Tech in various private and government institutions in Odisha. Aspirants can submit the OJEE 2017 Application Form until 10th March 2017. The Odisha Joint Entrance Exam will be held on 14th May 2017. It is a great opportunity for the aspirants who want to take direct admission in the second year of engineering after completing their diploma in engineering. All the aspirants are advised to check the eligibility criteria before the filling and submission of the application form. Candidates will be able to access their Odisha JEE Registration Form 2017 by following the step wise procedure given below. OJEE (Odisha Joint Entrance Examination) is a state level exam which is organized by the state government. The OJEE is conducted for the admissions in the lateral entry in B.Tech. Courses. The students after completing their diploma or B.Sc. can apply for this exam. There are many courses which undergo the OJEE. Aspirants passed/appearing diploma in appropriate branch of engineering from a recognized university or State Council of Technical Education and Training, Odisha. Aspirants must have scored 45% in 3 year diploma (40% for SC/ST). Aspirants must be a permanent resident of Odisha state. There is no age limit given for lateral entry in B.Tech. Aspirants who are willing to take admission in the lateral entry in Odisha state can apply for OJEE 2017. The deadline for the submission of OJEE 2017 Registration Form is 10th March 2017. The aspirants can the eligibility criteria for filling the registration form. The mode for the submission of application form is online. There are some steps to follow for the submission of the form online. Now, click on apply online link present in the notification panel. Fill all the desired information required for the application form carefully and correctly. Now attach a scanned copy of photograph and signature to the application form. The application fee will be paid only by net banking, credit/debit card etc. Now click on the submit button to submit the registration form. The application fee for the Odisha Joint Entrance Examination 2017 Registration form is Rs.1000. This examination is State level exam for undergraduate applicants admission. The college allotments will be based on student’s rank. Students who want to governments colleges must be the score in Odisha Entrance Exam high. The Application form for Odisha Joint Entrance Examination 2017 are available for the aspirant who are willing to take lateral entry admissions in various engineering institutes and colleges in Odisha. The last for the submission of the OJEE 2017 B.Tech Lateral entry Application form is 10th March 2017. The OJEE 2017 Exam will be held on 14th May 2017. The results for OJEE 2017 will be declared in the first week of June 2017. For more queries regarding the Odisha Joint Entrance Exam 2017 Application Form can contact us by commenting in the comment section given below.